New stock mode and ELO rankings for the top players. Subsidiary dividends now come each turn. Offworld Markets launch faster if next to Warehouses. Hacker Arrays are faster next to Offices. Patent Labs are faster next to Labs. Upgrade Labs are faster next to Toolshops. 2-3 players: start with 1 share of stock. 4-5 players: start with 2 shares. 6+ players: start with 3 shares. Fixed issues with team game. The main menu will indicate if there is a lobby available. Displays "Game Available" next to multiplayer if a lobby is up or a player is looking for a quick match. Fixed replay after a multiplayer AI game. Player list now re-orders when players lose and become subsidies. Double clicking on lobby entry now takes you to that lobby. New version of tutorial 1. Fixed a 3-4MB/minute memory leak. Recording application errors to the cloud. Defaulting new installations to fullscreen. Drawing ambient occlusion behind depth fog. Fixed camera mouse drag when switching between Offworld and other applications. Increased the number of extra tiles around the edge of the map. Reduced the number of internal objects by 30%. 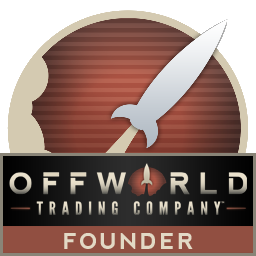 Fixed missing Offworld Rocket trail. New building complete sounds. There is a unique sound for the four building types: mining, factories, power, and advanced. New sounds for opening and closing the tabs.